Since I live in Sweden where Thanksgiving isn't a national holiday, I celebrate it on a Saturday. It's my favorite holiday where we enjoy the bounty of fall and appreciate those around us and all that we are fortunate to have. A handful of special friends gather and this year it was extra special because everyone made a dish or two to contribute to the table. I gave some suggestions and then people made what they wanted. 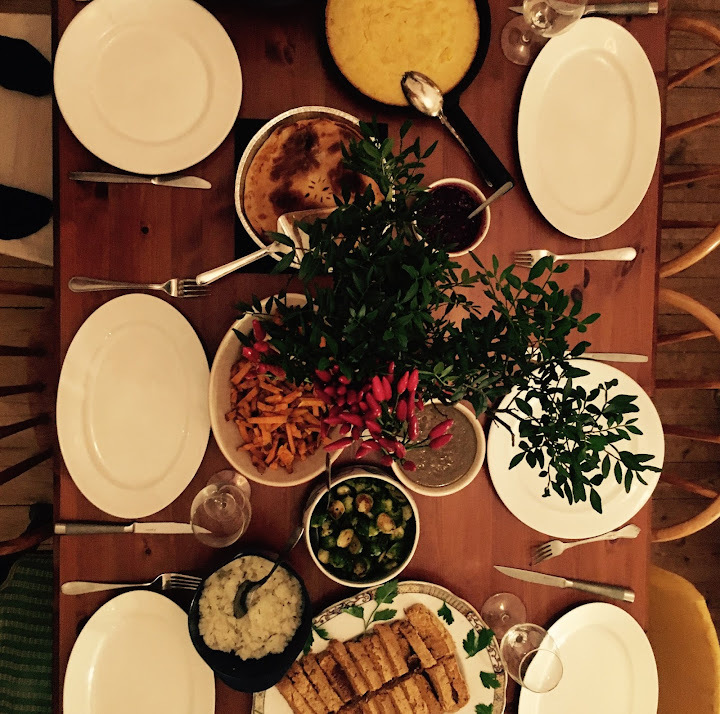 This works out perfectly because everyone brings a dish that they lovingly prepared and that also means that the host isn't utterly overwhelmed with having to make the whole feast alone! Just make sure to let everyone know how many people will be attending so that they make the appropriate quantity! Thanksgiving loaf (recipe below) - a combination of tofu and beans make it a hearty and flavorful centerpiece that even carnivores appreciate. Mushroom Gravy - loaded with onions and mushrooms, it's got the perfect umami for the loaf. As I had someone allergic to gluten, I thickened the gravy with white beans instead of wheat flour and it turned out swimmingly. Sally's Mushroom & Ale Pie - my friend Sally had the brilliant idea of adding a bottle of ale to pie and it is poetic. Roasted brussel sprouts - that caramelization converts all brussel sprout haters! Corn Pudding - I wanted to re-create the corn bread pudding from Chevy's Mexican restaurant as well as the corn pudding casserole that's normally made from a mix, eggs, sour cream and butter but without all of that. It came out amazingly moist (almost like a spoon bread) and sweet and am thankful for the recipe, especially as it's gluten-free. It looks really festive baked and served in my heirloom cast-iron pan. Sweet potatoes - my friend Andrea came to the rescue with these perfectly roasted sweet roots. Cauliflower mash - a perfect stand-in for your regular potatoes. Kale salad - friends Bo & Gerda made the perfect salad with lemon, olive oil and dried currants. So simple but so effective. Cranberry chutney - the added ginger adds a bit of kick and the sweetness balances the savory perfectly. 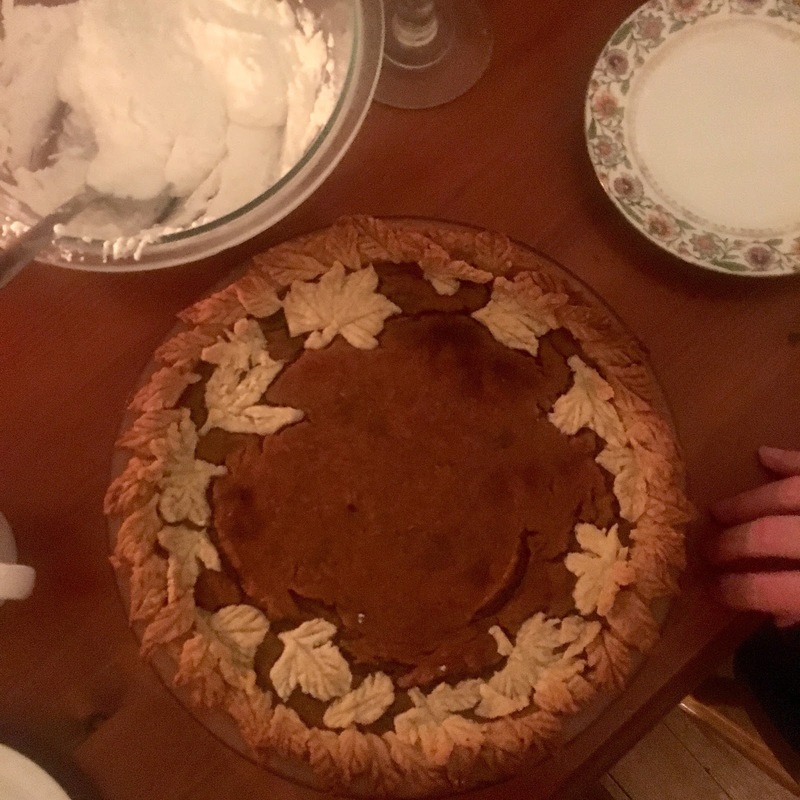 Pumpkin Pie - I always make pumpkin pie and love decorating it. The buttery crust behaves best when it has had many opportunities to rest and chill so I make it at least two days in advance. I usually look out for a pumpkin sale, roast and puree it and then it waits for me in the freezer until assembly time! I tried the vegan recipe from Chalkboard Magazine and it's perfect. 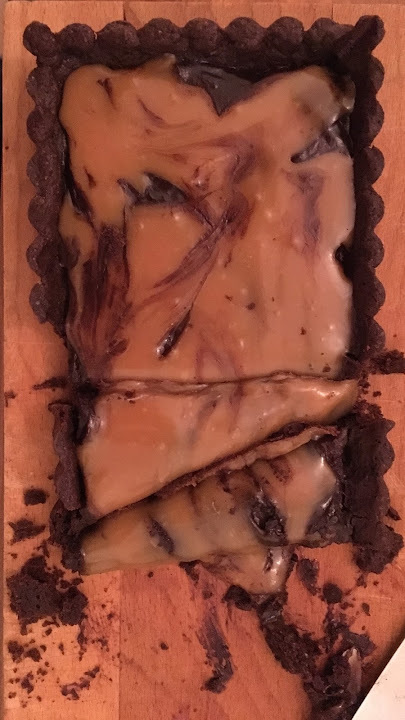 Salted Caramel Chocolate Mud Pie - heaven. 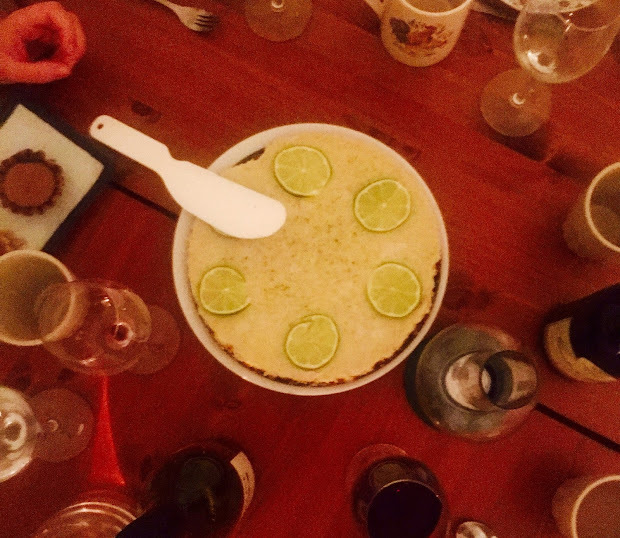 Key Lime Pie - after gorging on a feast, a citrus dessert is the perfect way to cleanse the palate. Next year I would really like to try a stuffing with roasted chestnuts and maybe bring pecan pie back! What is your perfect Thanksgiving menu? Sautee onion and garlic in oil until soft. Add herb de Provence, paprika, chili flakes and island spice seasoning. Mash tofu, oats and beans in food processor. Add the onion mixture, tomato paste, soy sauce, bouillon, Worcestershire sauce and parsley. Check seasoning, then add salt and pepper. Add the gluten flour last and mix thoroughly. Shape into a flat, even free-form loaf and rub the surface with oil. Bake 200C or 400F degrees for 30-40 minutes. Don't let the bottom burn. Slice before serving and garnish with extra parsley. Serve with mushroom gravy. *To make this gluten-free, use rice flour.